As the world is virtually merging culturally, when you are unable to understand the language, the one thing that can let you enjoy the videos is subtitles. The most common subtitles being in English allows people to consume it worldwide, irrespective of its regional origin. Without dubbing the video in your language, it becomes pretty easy to understand if you get subtitles. Downloading subtitles of a movie for a new language that you are learning becomes easy for you. As you will get to learn the language easily, by picking the way people greet or converse as well as quickly identify what they call the objects etc. When you understand the meaning through subtitles, the visuals assist you to remember the terms easily. Being visual learners, humans tend to memorize things when they see it. And this fact immensely assists you in learning a foreign language. Apart from all these advantages associated with subtitles, we have compiled amazing options for you to download subtitles and enjoy learning new language or enjoy videos for a non-native or non-English language. Besides, you can also save photos from video with subtitles. We’d like you to continue reading to explore about the list of subtitles we have collated here. If you want to edit movies, FilmoraPro is here for you. You can edit subtitles, add texts, and sync audio automatically. More than 20 build-in title templates can be added to your movie easily with just drag-and-drop. Various video effects will make your video amazing. Auto color correction will give you cinematic color flair. Just download it now to have try (Free)! Filmstocks is a one-stop shop for royalty free video effects, music and sound effects, stock video footage and more stock media. You can download both video effects such as titles, filters, elements, and transitions for Adobe After Effects and Filmora9 Video Editor as well as some free stock video and photos and royalty free music and sound effect. Check the collection of Titles & Text templates and Effects for After Effects and explore more creative effects for your video. ‘YIFY subtitles’ has a wide range of movies across languages. The site comes with a nice interface that makes selection of your desired movies with suitable subtitles easy. While downloading subtitles, the interface takes you to a PDF download page, which is bit tricky. It features most liked movies, latest movies, recently added movies, and popular movies on different sections. It is easy to navigate through the page. You can select movies according to language and genre. When you open any movie, you get the option to see the year and rating as well. This website has a plethora of subtitles for your favorite movies that you can download. It has a very simple and obsolete interface. It also contains Ads at the top of the page. You have the option to edit the subtitle filter on the page. Movies, TV series, and music videos are also available with this page. The page also features the number of total downloads for a said movie subtitle. This subtitles site contains movie subtitles only. The Ads are pretty annoying and distracting from the page content. For watching DivX/XviD movies with subtitles on Windows Media Player, you need to install a filter called DirectVobSub. As the subtitles are zipped with WinZip, you need to extract them after downloading. The subtitles can be found in multiple languages. 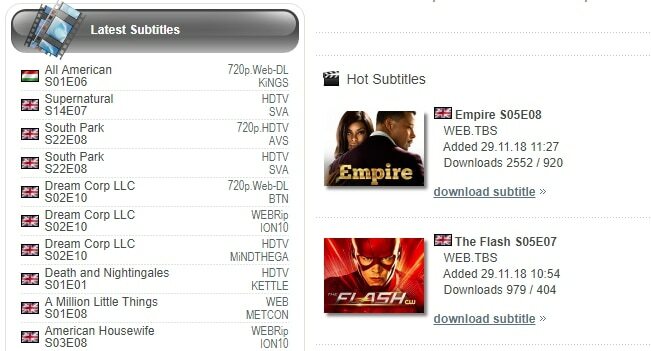 It categorically arranges most downloaded subtitles, latest subtitles, as well as top movies. This website contains much more than movie subtitles and allows you to even upload subtitles to it apart from Downloading subtitles. It contains almost 4,700,000 subtitles for you to consume. The page has irritating Ads and a click or scroll mostly opens another landing page or Ad page. However, getting rid of the Ads is possible, only when you subscribe to a VIP account. It also has a subtitles player embedded on the page that you can access. You can watch movies from torrent websites and save the download time. Though, TV Subs has Ads featuring the top banner of the page, they are less distracting compared to other movie subtitle pages. It has a huge subtitles database in multiple languages. WinZip is used to pack the subtitles. You can download as well as upload subtitles on this page. You have the option to select the language and find the movies having that particular subtitle easily. The subtitles are arranged depending on top TV shows, most downloaded subs, latest subtitles. You can also find the number of downloads depending on the languages at the bottom left part of the screen. Here is another website for serving your purpose. With Addic7ed you can download subtitles for TV shows and movies alike. The site has options for signup, though you can download the subtitles without registering. 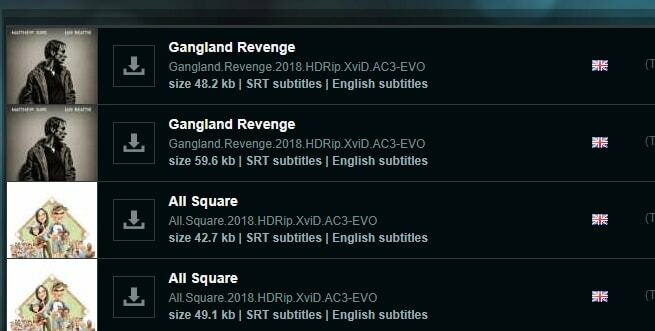 You got to scroll down to see the list of available subtitles. 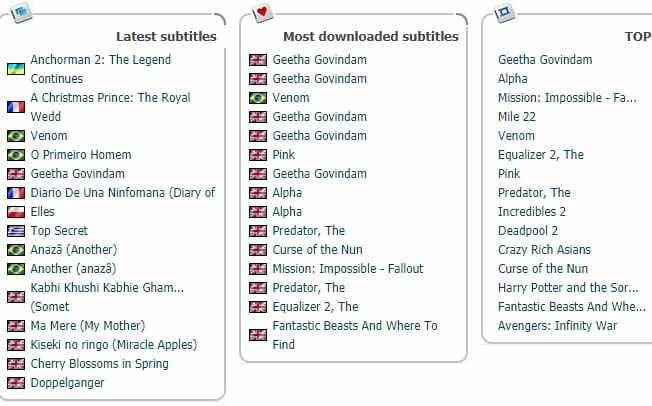 There are various categories for subtitles, ranging from new releases to latest new versions. The site even has the option to show you which movies or shows are being translated and that have been done translating. Which files have been downloaded today at the highest and latest uploaded ones are also featured on the page. 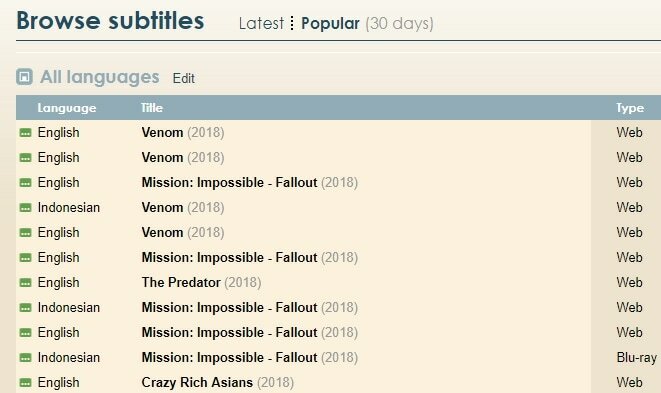 To watch the movies with subtitles, you need to download DirectVobSub. The website looks pretty confusing, as you can’t find any subs at the first glance. Also this website contains what a subtitle means. You can simply tap on the letters given at the top to find the subtitles according to your need. As the frame rate and length cut of the divx movies differ, you might need to adjust them as per your need. The site contains an attractive and neat interface to choose movies from. The welcome respite is, there are no irritating Ads over there. On the top bar of the page, you find how the movies are arranged. You can find both movies and TV series subtitles here. 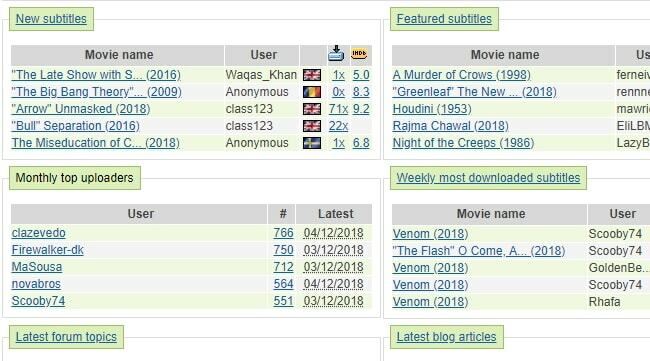 You can see the last added subtitles of movies which are displayed on the top position of the page. Language, genre, country, tags are there to arrange the movies and TV series on the website. This page has the search bar at the top, where you can enter the movie name to find the subtitle. Ads on the page are pretty distracting for the user. 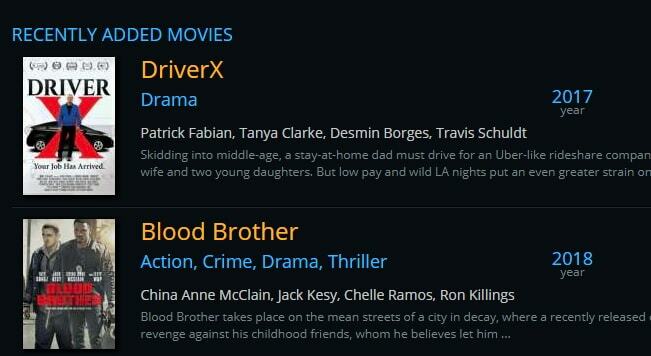 Recent movie releases are posted on the right side of the page. You can click the ‘Browse’ button to go through the large collection of movies found in the page. Every movie has an IMDB rating against its name. Movies are arranged as per genre, language, country and so and so. The search box is at the top of the page and you can type a name to find the subtitles. 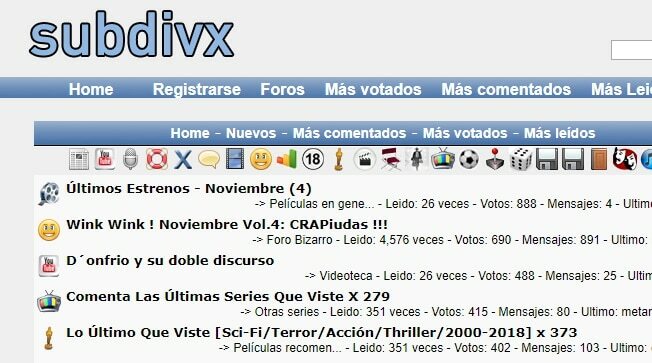 The site features movie and TV series subtitles. There are Ads on this page, though less annoying compared to other subtitle pages. You can also add subtitles to this page. It has a RSS channel as well as mobile version. Though the site has a long list of subtitles, it is not in English. A non-English site is obviously difficult to follow by any user, as they might not know the language. The site doesn’t have any Ads, which is a boon for the users. The interface is really easy to understand. You can take advantage of forums facility and filtering through ‘More Commented’ or ‘More Voted’ movies. The page interface is very simple and neat. Though, such a neat interface might at times deter movie lovers, as there are not even previews for movie or TV series are visible on screen. This page contains movies as well as TV series. The bottom portion of the screen showcases recently added movie subtitles along with the language. While speaking of subtitle downloading, we personally loved this site. If you could not find a movie subtitle, it helps you Google it right there. High definition videos are available with this website that you can download and enjoy. Though, it has a simple interface, it doesn’t feature any movie or series on the main page. To make users’ life easy, the page contains user guides that one can follow to understand the usage of any video software. The website has both movie and TV series subtitles. You can find them on 2 different categories displayed at the right hand side of the page. 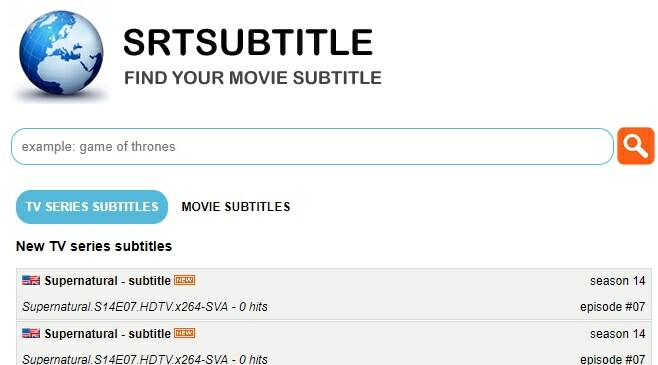 New TV or movie series subtitles are featured at the main portion of the screen, as per your selection tab, i.e. ‘TV Series Subtitles’/’Movie Subtitles’. The top part of the screen has the language buttons there; you can tap on them to pick the subtitles on that particular language. Also, the same buttons would change the page language as well. So, be careful while selecting the language button. Thankfully, there are no ads unlike other websites. This page has some meat apart from movie and TV series subtitles. It also contains workout videos to help you maintain a healthy life. 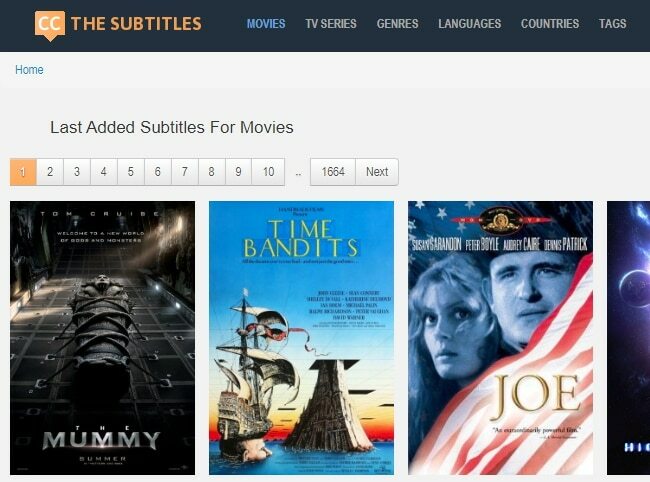 You can find the latest movie subtitles in 2 categories, i.e. English and other languages. You need to pick your desired option to get the best out of it. From the top portion of the screen, you can easily pick a letter and find movie subtitles starting with that particular letter and make life easier. You can even download software from this page. There is no doubt that the internet is full of subtitle downloading sites and you can literally get anything on your system. But the most grueling task is merging the subtitles with your favorite movie. To make life simpler and let your movie or TV series in an unknown language more enjoyable, FilmoraPro is the only tool that can do wonders. You don’t have to be a pro movie editor for adding audio, video and subtitle or effects. All that you want for an interesting movie time is downloading FilmoraPro and within a few clicks, your movie time goes awesome. We found that selecting FilmoraPro allows you more flexibility for enjoying your favorite videos with the perfect subtitles without any trouble. Happy watching!